In 1980 Universal released "The Blues Brothers" featuring John Belushi and Dan Aykroyd and many famous musicians and other famous actors including John Candy. It has now since then become a cult classic. The movie is a tale of redemption for Jake Blues and his brother Elwood Blues, who take on "a mission from God" to save the Catholic orphanage in which they grew up from closing down. 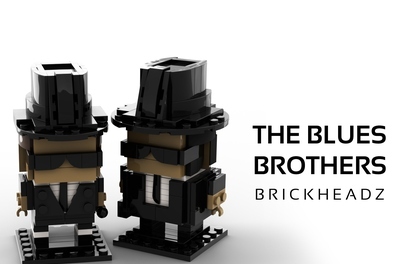 To do so they must reunite their band "The Blues Brothers Band" and organize a concert to get the $5,000 to pay the tax assessor Steven Spielberg. For reference I toke some Fotos from the movie-dvd on my flat screen with my smartphone to design as true to the movie as possible in Lego. The scale of the Blues Mobile compares to the Lego Ghostbusters Ecto One. 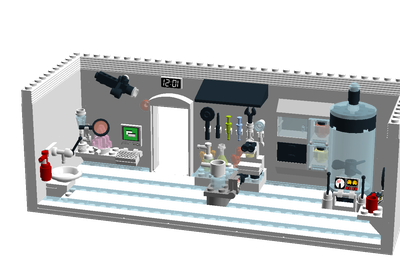 I don't know how many bricks I used but I think it would be sold for 49,99€. I decide to create the Blues Mobile with the big speaker on the to. But it's easy to dispatch the speaker including the speaker construction to open the boot on the back or to open the roof to take a look inside of the car. The inside of the Blues Mobile is highly detailed with speed'o'meter, cigarette lighter and radio. The great boot can be open to store or restore the music equipment included in the set. You get two microphones, two microphone stands, a case and a poster featuring the concert. 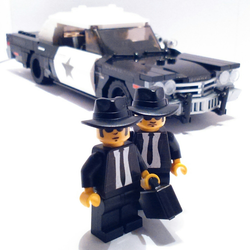 I decide to create a little stand for the Blues Brothers. 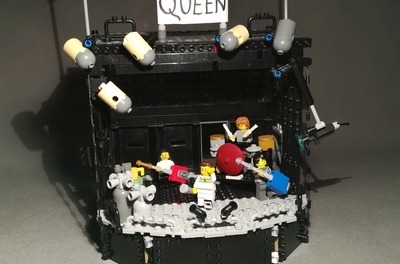 It looks something like a small stage and fits with the equipment. The sticker....I do some art work for higher details and greatest look.